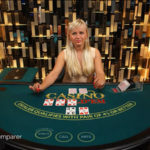 BetVictor Live Casino | British dealers and dedicated tables. 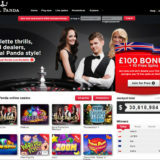 Bonus: For the latest information on Bonuses and Promotions visit the Bet Victor website. 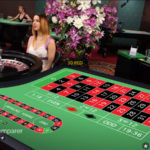 BetVictor has a fine Live Casino provided by Evolution Gaming. 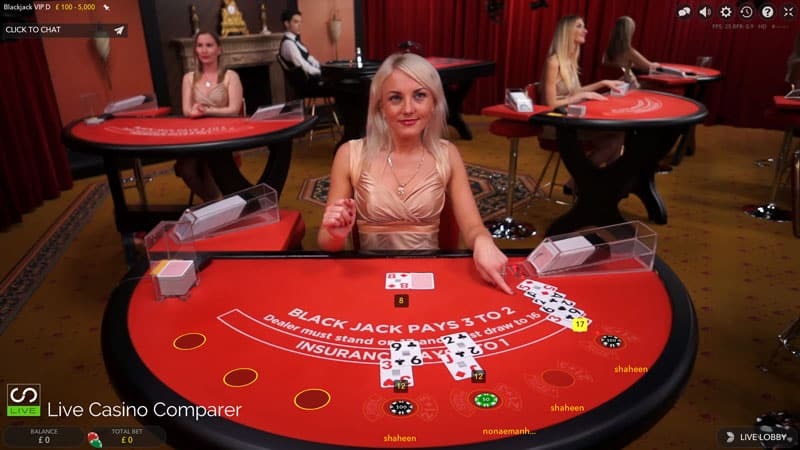 Whilst no longer having loads of providers they do have a dedicated Blackjack table that doesn’t get that busy. 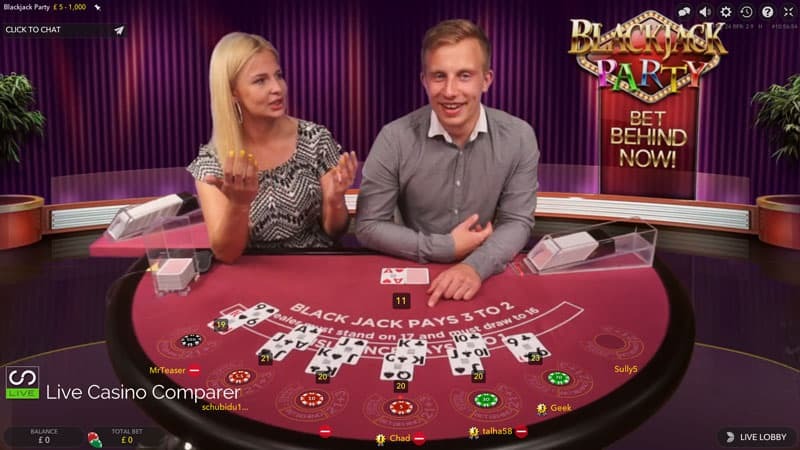 It’s always worth a visit if you want to play Blackjack. 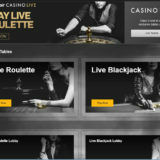 The BetVictor Live Casino just continues to evolve. Over the years they’ve had up to 5, but as of March 2018, they now only have 1 and that’s from Evolution Gaming. 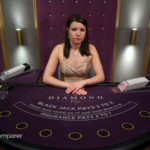 Fortunately, they still offer high-stakes blackjack at the BV Grand live casino, so that’s still a unique selling point. I’m pleased that they are constantly making changes and suspect that this may not be the last. 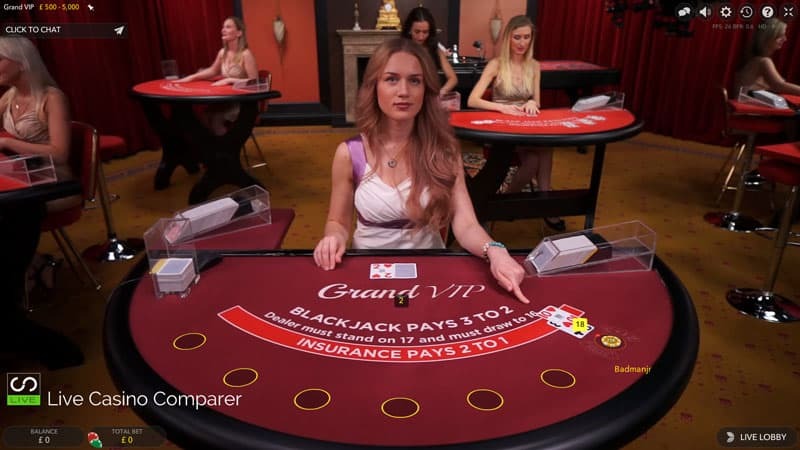 The previous change in June 2016 was the addition of a dedicated Live Blackjack table at the BV Grand Live Casino. Keep this as your secret as the table is normally free during busy periods, so you’re always likely to get a seat. I’m still a loyal player, so I won’t be going far as they make it extremely easy for me to play there. 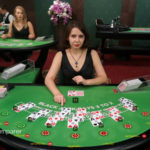 But I do still play at other live casinos and you can see what I think of them in my growing list of Live Casino Reviews. 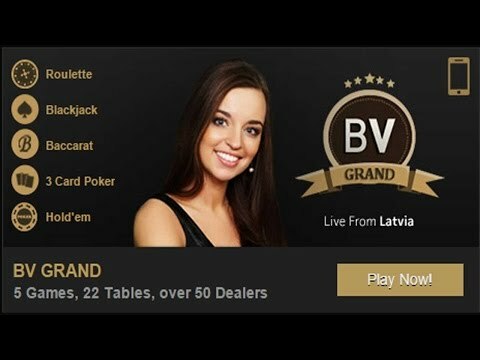 The BV Grand is powered by Evolution Live casino software with tables streamed from studios in Malta, Riga & Bucharest. It gets busy around 10 pm with the busiest nights being Thursday through to Saturday. 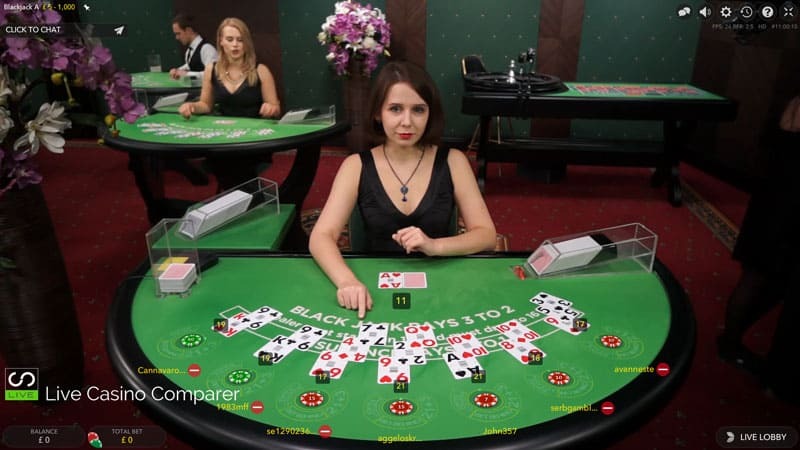 Roulette, Blackjack, Baccarat, Casino Hold’em, 3 Card Poker, Caribbean Stud Poker, Ultimate Texas Hold’em & Dream Catcher can all be played. There are loads of variations of the most popular games. 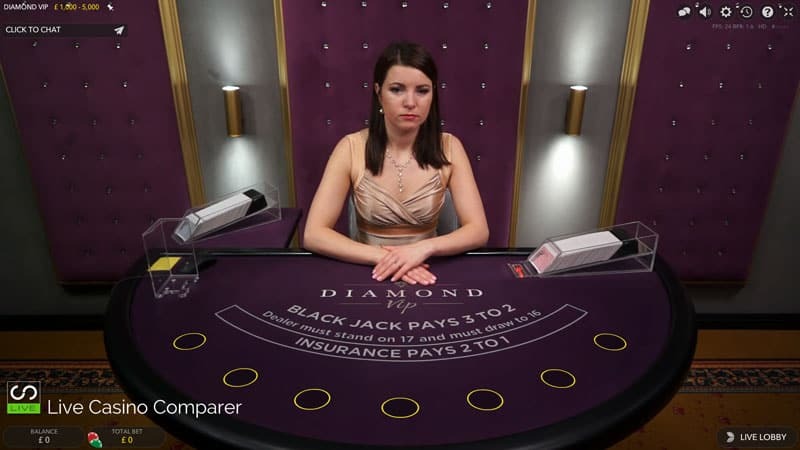 Blackjack has loads of tables, all with side bets and different stake ranges. There’s normally something to suit everyone. 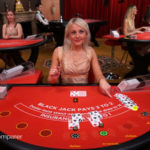 The Salon Prive Tables for Blackjack and Roulette offer very high stakes players the opportunity to play privately and control some aspects the games. 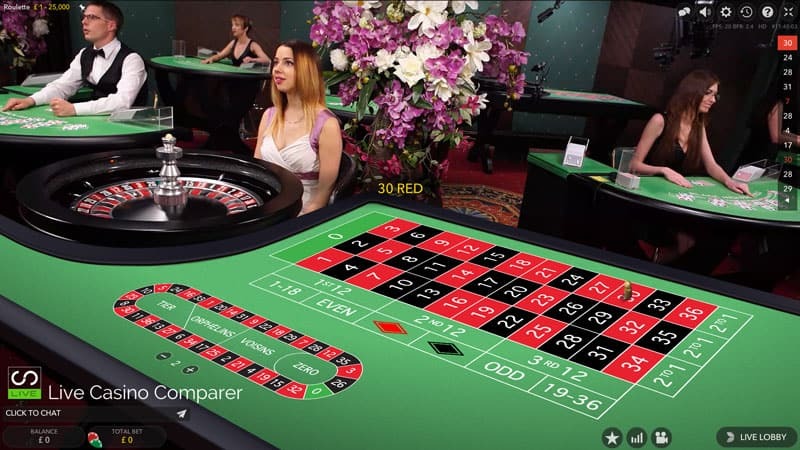 Roulette players also get the choice of studio or land based tables to play on. 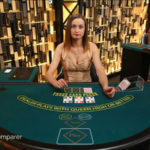 With La Partage on the French tables there is a real variety of European and American style Roulette tables to chose from. 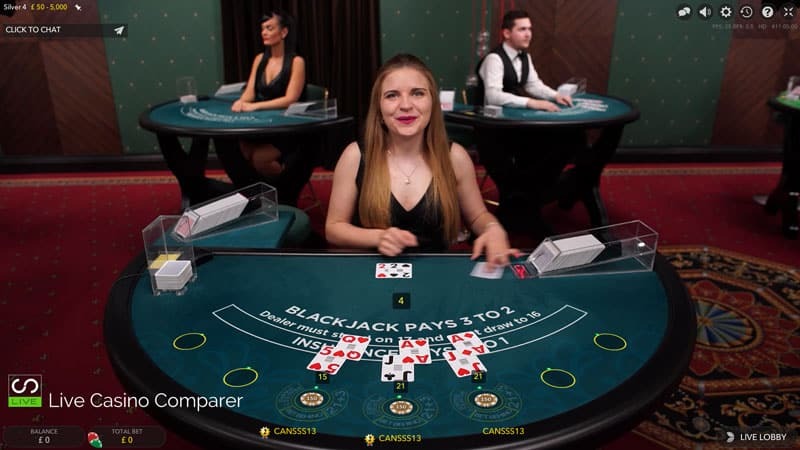 Casino Hold’em & Caribbean Stud Poker both have Progressive Jackpots, which are currently running at £2,478,086 for Casino Hold’em and £536,057 for Caribbean Stud Poker. 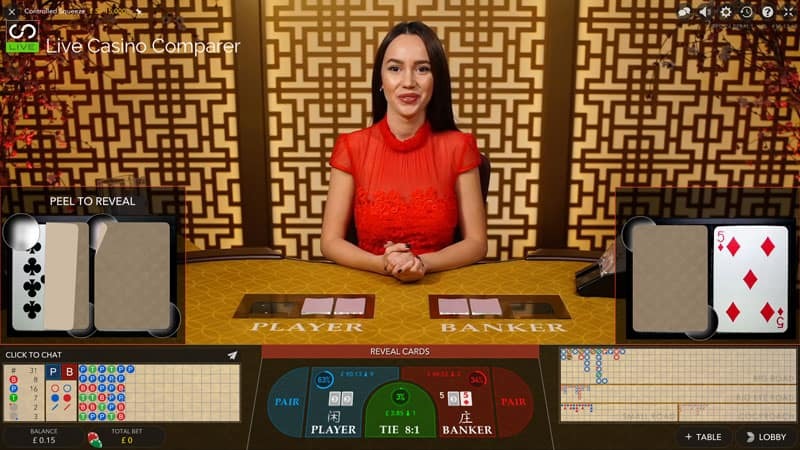 Baccarat comes with Speed, Squeeze and normal play modes. All have optional side bets. 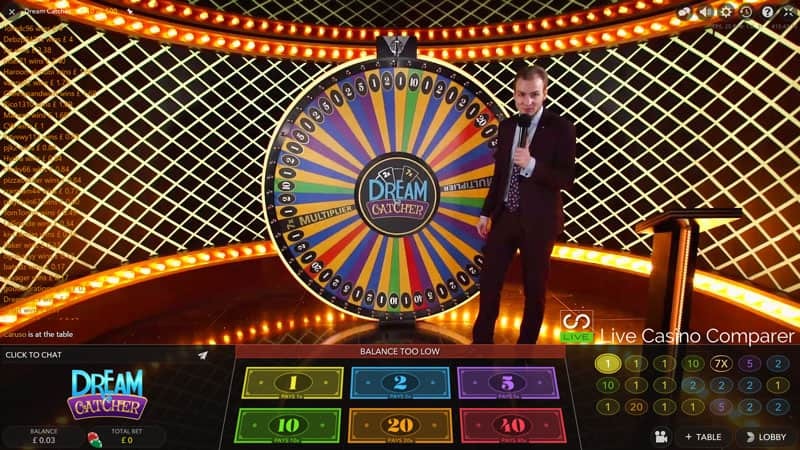 Dream Catcher, Ultimate Texas Hold’em and 3 Card poker complete the line up of games. 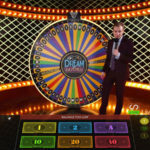 I like the playing interface, it has everything you need and you can pick your viewing mode to suit your own preferences. 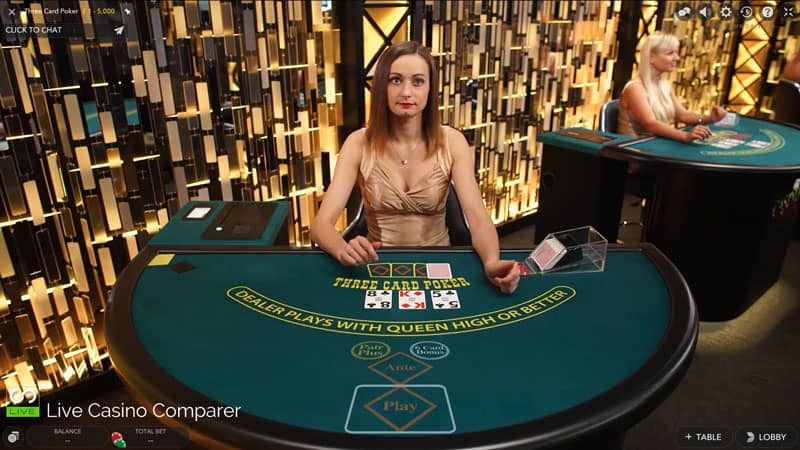 The pace of play is pretty quick, certainly faster than some of the dealing rooms I have come across, so if you’re after a slow game this might not be the place for you. 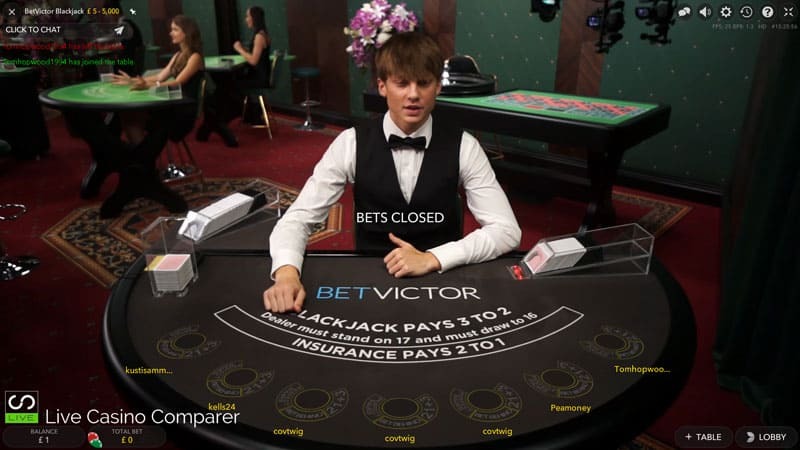 The BetVictor Live Casino is very playable. 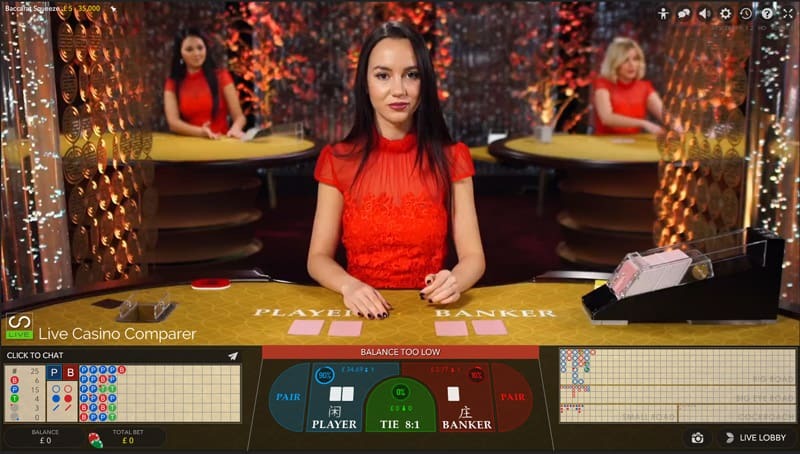 The interfaces are straightforward and not too complicated and like most other live casinos, you have the option to choose your display, from pure live dealer video feed to a mixed mode with the computer generated overlay. 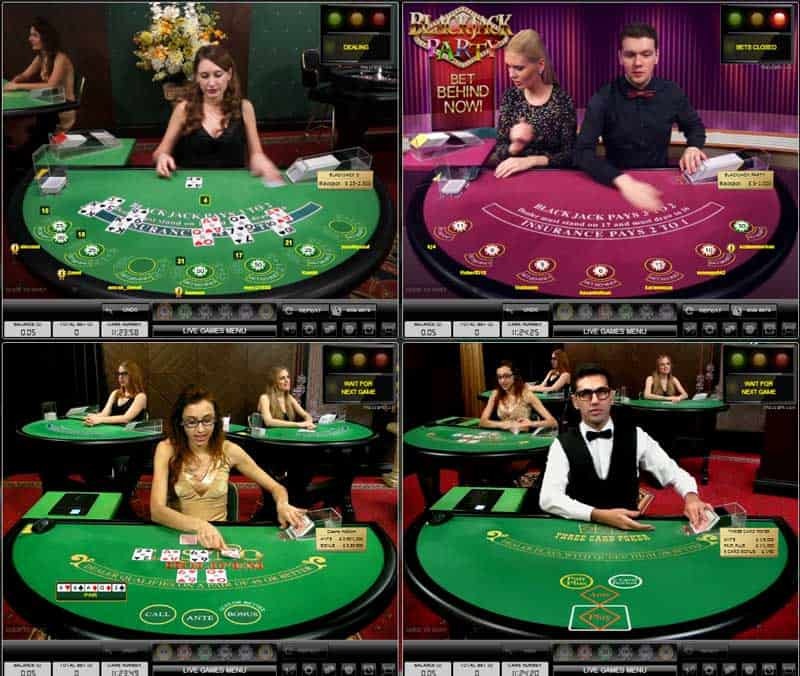 I found the dealers to be especially chatty at Bet Victor, for me that enhances the enjoyment. You can choose not to chat and even switch off sounds. The dealers also cross chat a bit, which either you like or don’t, but for me, it just makes it more real. 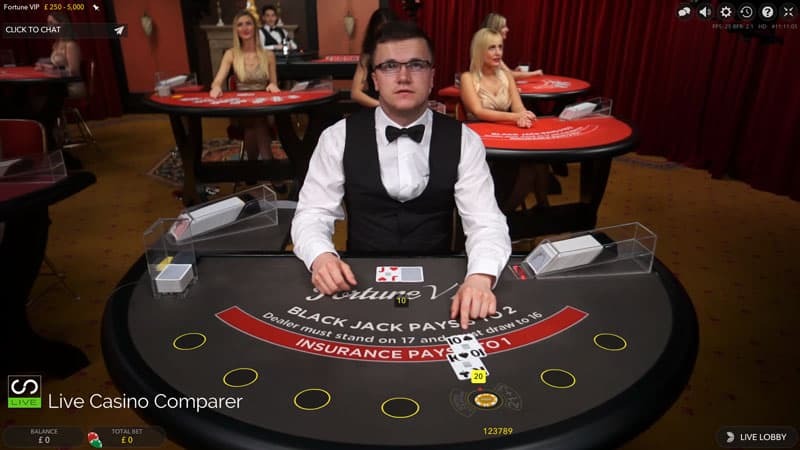 BetVictor uses one live casino software provider. Evolution. 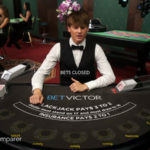 BetVictor provide a range of deposit and withdrawals options for each country that is permitted to play at the casino. The best bet to see what is offered for your country is by visiting the banking options. I tend to use my Debit card and never have problems with depositing or withdrawing. Countries excluded from play at BetVictor includes Armenia, Antigua, Cuba, France, Hong Kong, Iran, Malaysia, Moldova, Myanmar, North Korea, Philippines, Spain, Sudan, Syria, Turkey & USA. 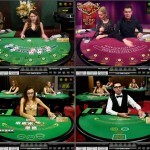 If you reside in one of these then try one of the other casinos listed in the review section. 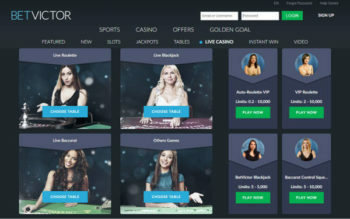 BetVictor are licensed and regulated by the Gibraltar Gambling Commissioner and the UK Gambling Commission. They are audited by various bodies and you can find the last 3 months worth of reports on their website. They operate a raft of security measures including fully encrypted data transfer and multiple redundant servers to ensure that all customer funds and personal details are stringently protected. Every card that is submitted to them is subjected to a series of comprehensive online checks with their bankers to confirm its validity. I like the fact that they are transparent with what they do and have never experienced any problems. For information on the latest Bonuses and Welcome offers visit the BetVictor Website. Loyalty is rewarded by an invitation to join the VIP Loyalty program. 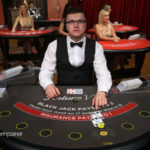 Qualification is based on how often you play and how much you wager. 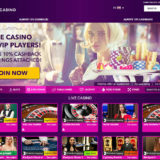 For that, you get exclusive promotions, bonuses and promo cash rewards. Should you have any problems or queries, then support is available on a 24 x 7 basis, using Email, Instant Chat or Telephone. 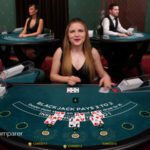 I am a fan of the BetVictor live casino because they have lots of tables, a really good software interface and they have a diverse range of stakes. 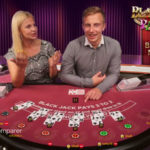 That and the ability to make bets behind and side bets in blackjack mean for me it’s as close to the real thing that I can get online.